This sign was carried by one of our Peace Village teachers at Eugene, Oregon’s annual March protest against the war in Iraq. The explicit, rhetorical question carries within it, naturally, several subtler, implicit ones. 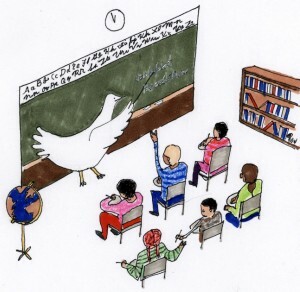 One of the main critiques suggested by this question is that “peace,” as a subject, philosophy, or even as a topic for class discussion, is rarely addressed in our public school system. By peace, of course, I mean the practice of nonviolently negotiating our points of conflict on every level of human interaction, from the personal to the interpersonal to the international, rather than the more common regression to the “might makes right” Machiavellian form of problem solving that dominates the over culture of the United States. We see violent problem-solving vaunted at so many levels: in the music, video and motifs of popular culture, in popular pastimes like cage fighting, and of course, at the level of our national foreign policy for the last century. War and violent conflict have become such an unquestioned element of Americana, in fact, that it is even reflected in the Standards and Benchmarks established by the U.S. Department of Education. If you were to examine the State of Oregon’s Educational Department, reflecting the standards set by the federal government, and look up the base of knowledge 10th graders are expected to know in the subject of U.S. history, you’d see a long list of wars and violent conflict: the Revolutionary War, Civil War, WWI and WWII, Korea, the Cold War, Vietnam. This is what our students are expected to study. Sure, the Civil Rights movement sits in that list as an historical model of a conflict resolved using nonviolent methods, but it sits alone, a sole minority in a newly and, perhaps reluctantly, integrated classroom. With all of this in mind, Peace Village, a Eugene-based nonprofit which has been offering nonviolence education in summer camps since 1996, recently began a curriculum for middle and high schoolers that integrates peace studies around all of the major subject areas. Through a program called PeaceOut, Peace Village offers courses that adhere to Oregon State Standards for Education, but integrates them all around the subject of peace and nonviolent conflict resolution. We teach U.S. history, and yes, we cover all of the wars that the Department of Ed wants our children to understand, but rather than just delivering the events as if they were inevitable, we lead our students through inquiry-based learning to question the causes and assumptions that led to the wars, to investigate popular resistance to these wars, and even to question the victors’ depiction of the events. Our PeaceOut program offers physical education and health credits by practicing physical arts that help us achieve a calm mind and body: yoga, tai-chi, meditation, dahn mudo. We study the philosophies of nonviolence as written by Gandhi, Martin Luther King, Thich Nhat Hanh. We look at the conflicts in our own lives and how we might solve them by practicing nonviolence ourselves, in word and deed. By contracting with alternative and charter schools, Peace Village offers a comprehensive peace curriculum that covers four major subject areas, and practices in the classroom what we study in the world. Over the last two years, our students and teachers have developed a peer elder council, which works to address conflicts in the school using restorative justice techniques, and more recently, carried out a service learning trip to the Navajo Nation. This year, PeaceOut is joining with others to launch an after-school program which will guide students from several different spiritual and secular communities in a coming-of-age leadership project called the Wayfinders Rites of Passage group. Darren Reiley, the Executive Director of Peace Village, Inc., lives and teaches in Eugene. 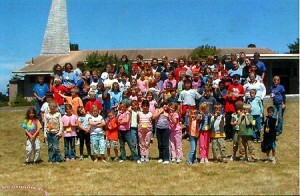 For more information on the PeaceOut program, Peace Village, or Wayfinders, visit www.peacevillageinc.org or call 541.338.7001. Photo of Darren Reiley is courtesy of Ken McCormack. Peace Village group photo: www.peacevillageinc.org. Cartoon by Natalie Whitson.